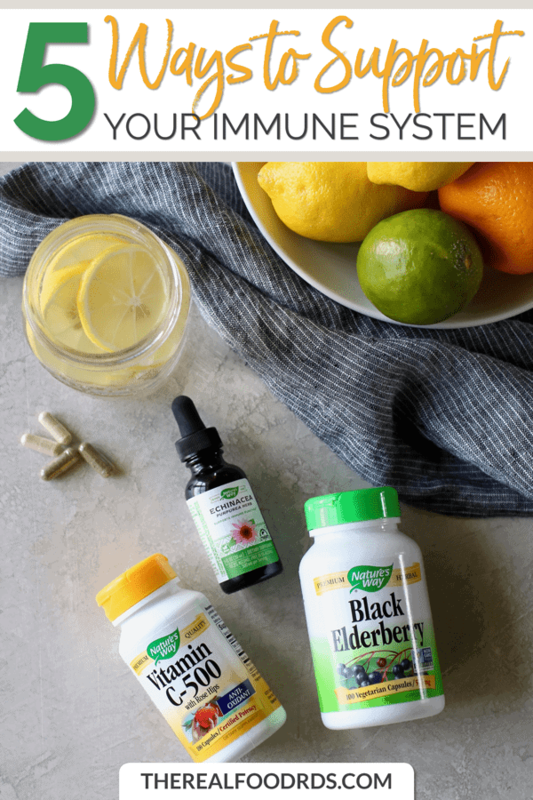 Sharing 5 Ways to Support Your Immune System because no one has time to be under the weather. 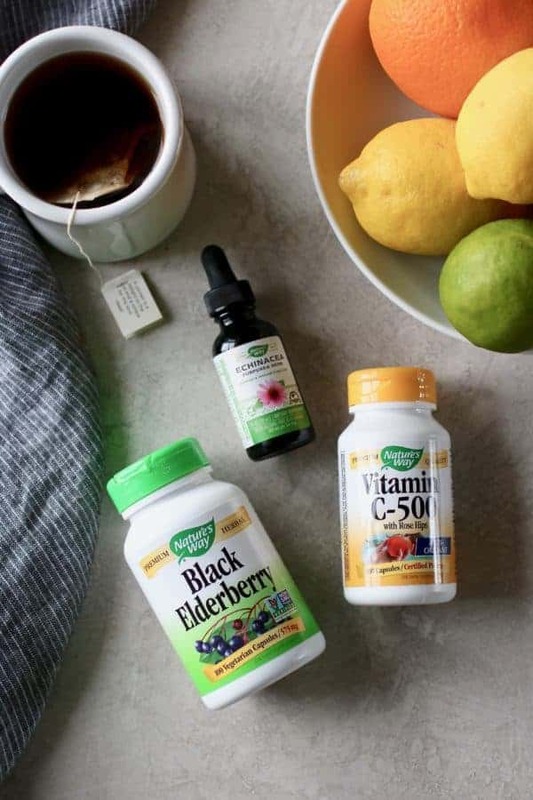 Today we’re sharing 5 Ways to Support Your Immune System along with our friends at Nature’s Way. We want to help you stay healthy, not only when the weather turns cold, but all year round. While there are no guarantees that following these recommendations will make you superhuman but they will certainly help to improve your overall health and therefore support your immune system. Better health means better quality of life! Adequate sleep – A lack of sleep can result in a decrease in your body’s production of infection-fighting antibodies which increases your chances of succumbing to viral illnesses such as a cold or flu. Most adults needs 7-8 hours of good-quality sleep each night to feel rested and to support their immune system. Having a pleasant bedtime routine, avoiding or reducing blue light from screens, and getting outside during the daytime all help to support healthy circadian rhythms which in turn support healthy sleep and a stronger immune system. Vitamin A (as beta-carotene) – Sweet potatoes, carrots, red bell pepper, dark leafy greens such as kale and spinach, apricots and winter squashes are all great sources of beta-carotene, a vitamin A precursor, that’s vital for healthy immune function. 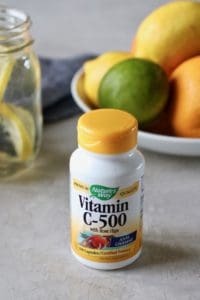 Vitamin C – Citrus foods such as oranges, grapefruit, tangerines, lemons and limes are all naturally high in vitamin C but so are bell peppers, strawberries, kiwi and papaya. Vitamin E – Nuts and seeds of all kinds are a delicious way to get more vitamin E in your diet. Zinc – Good sources of zinc include red meat, poultry, seafood, beans, seeds and nuts. 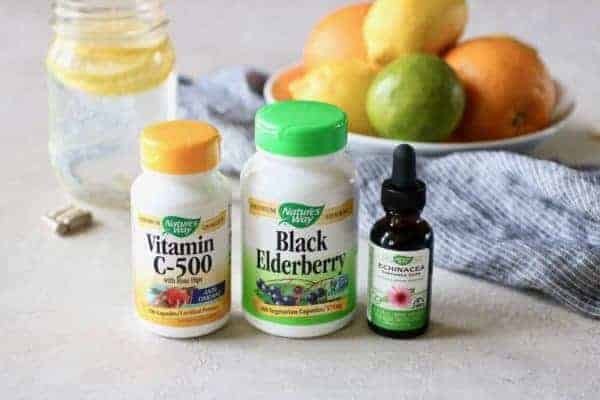 Gut health – Adding probiotic-rich foods to your diet are a great way to boost immunity since more than 70% of immune-related tissue is in the gut. Naturally fermented foods such as sauerkraut, pickles, kimchi, kombucha, kefir and yogurt are delicious ways to support gut health (and thus support your immune system). Try our easy Homemade Sauerkraut and Fermented Carrots with Dill recipes to make your own at home. 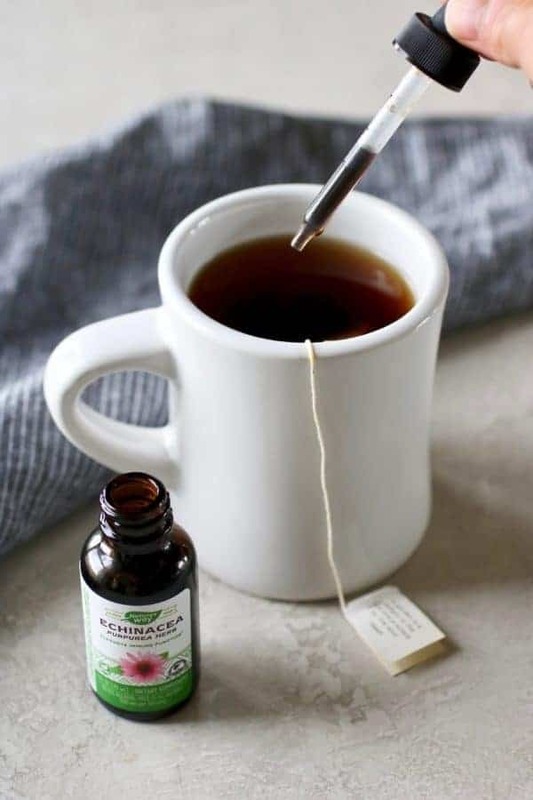 Stress reducing activities – Anything that reduces your stress levels in a healthy manner will support optimal immune function. Some of our favorite ways to reduce stress include exercise or daily ‘movement’, getting outside (even when it’s hot, cold, raining, etc. – just dress accordingly! ), taking time to enjoy hobbies, spending time with friends and family, meditation, reading, taking a hot bath or enjoying a massage or a good haircut. 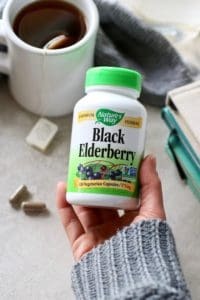 Black Elderberry is a popular herbal remedy, especially during the winter season. High in antioxidants such as phenolic acid, anthocyanins, and flavonols, black elderberries are native to Europe but are now grown in many other parts of the world. Nature’s Way travels to the countries and continents where herbs have always thrived. Indigenous regions where the conditions are right and where generations of growers and harvesters have preserved and shared their knowledge and practices over time. 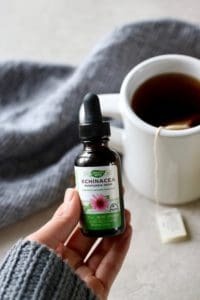 It’s their way of bringing you the purest botanicals possible and their way of helping you live healthier every day – the way nature intended. Nature’s Way is the first major brand to be TRU-ID™Certified. TRU-ID is an independent testing program that uses cutting-edge DNA biotechnology to ensure the authenticity of our herbal products. With TRU-ID validation, you can be sure that the herbs listed on their labels actually match what is in their products. In keeping with their mission to follow the best sourcing, manufacturing and testing practices, Nature’s Way is committed to providing non-GMO products. That’s why they’ve partnered with the Non-GMO Project, North America’s only independent verification program that ensures products are produced according to the best practices for GMO avoidance. Look for the seal to discover which Nature’s Way products are Non-GMO Project Verified. Remember, that your immune system relies on you to do your part to keep your body healthy and optimally well. 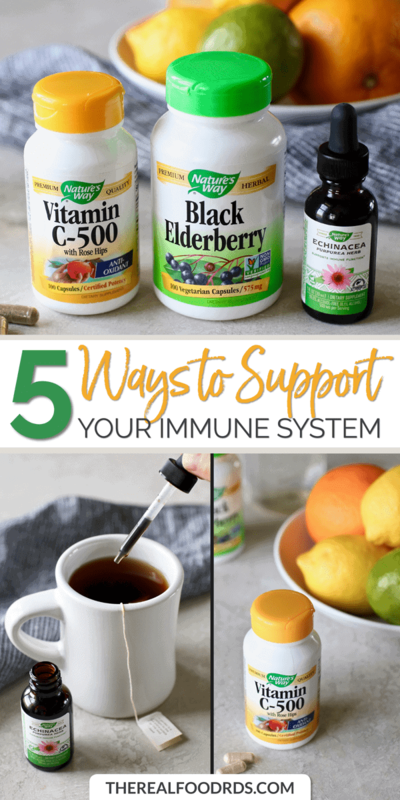 That’s why we recommend these 5 ways to support your immune system. This post was made possible by our friends at Nature’s Way. Although we received compensation for this post, the opinions expressed here are – as always -100% our own. Thank you for supporting the great companies we work with thereby allowing us to continue creating great recipes and content for you.